Guyanese anti-drug agents Thursday discovered what is likely to emerge as a huge quantity of cocaine stashed in plywood in that was about to be shipped to the United States (US), Head of the Customs Anti-Narcotics Agency, James Singh said. He told Demerara Waves Online News that the Customs Anti-Narcotics Unit (CANU) and Customs, under the auspices of the United Nations Container Control Programme, were unloading the plywood and removing the cocaine. 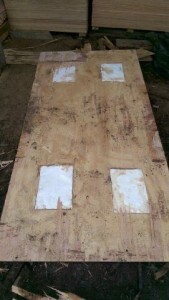 The CANU boss said the plywood was found in a 40-foot container that was being packed at Yarrowkabra, Linden-Soesdyke Highway. Three persons, including the shipper, have so far been arrested by anti-drug agents. The shipper is the owner o f sawmill at Yarrowkabra, Linden-Soesdyke Highway. According to Singh, the sawmill owner/shipper has sent plywood to the United States before. In the past, cocaine has been found concealed in detergent, fake awarra, fake peppers, canned coconut milk, furniture, star-apples and other items.